Israeli soldiers penetrating the edge of Gaza City have encountered hundreds of booby traps and a warren of tunnels, which enable Hamas fighters to move from one house to another unseen. 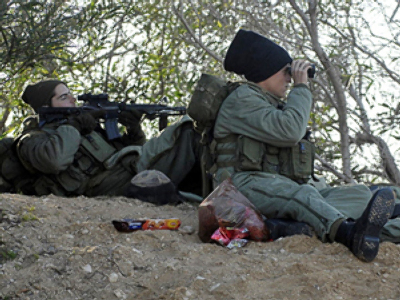 Officers interviewed by the Israeli media say the guerillas have been emerging from tunnels to fire at close range, then pulling back in an effort to lure the Israelis deeper into the built-up area. In one case, a Palestinian, dressed in an Israeli army uniform, opened fire on a group of soldiers. He was killed before he could cause any casualties. There have been several instances, according to officers, of would-be suicide bombers with explosive vests running towards soldiers. All were cut down. The troops have also been alerted to the possibility of female suicide bombers. A Hamas spokesman said last week that hundreds of suicide bombers, including women, are waiting for the Israelis. There have been attempts to capture Israeli soldiers, the officers said, and tunnels designated for this purpose have been identified. Combat engineers have been leading the way for the Israeli forces, dismantling the booby traps that have been left in great numbers, often set to detonate upon entry into a building. Thus far, there have been no reports of casualties caused by these devices. The army has not yet pushed deep into the built-up areas, which is something the government is threatening to do if a ceasefire agreement is not quickly arrived at. This stage would involve extensive house-to-house fighting and would almost certainly result in heavy casualties on both sides. Israeli officials say that if this stage is embarked upon, the army will remain in Gaza “weeks, if not longer”. Thousands of reservists mobilised early in the week have been refreshing their training in urban combat in a large army base near Gaza. They would reinforce the troops presently at the front if the fighting escalates. The army has used heavy fire power, including artillery, in order to reduce its own casualties, and has pursued what it calls an “aggressive” response to Hamas fire. This policy has increased civilian casualties. More than 40 Palestinians, including children, were killed in a United Nations school by a mortar shell said to have been fired in response to mortar shells fired by Hamas fighters in the school's vicinity. The policy has also caused extensive damage to property. The aggression has also accounted for four of the six deaths suffered by the Israeli army to date, victims of “friendly fire”. Some 150 men, most of them suspected Hamas fighters, have been rounded up, Israeli officials said on Thursday. They were brought in for questioning to a detention centre set up inside the strip where army intelligence officers attempted to glean information that could be of immediate use to the troops. Some were then taken to Israel for further questioning by the Shin Bet security service. Due to the numbers, police interrogators have been seconded to the Shin Bet to assist in the screening, officials say. The security service is presumed to be making contact with some of its numerous informers inside the strip and perhaps recruiting more. It is the first time since Israel's withdrawal from the Gaza Strip three years ago that the service has had direct access to large numbers of Gaza residents. The army, which has been preventing the entry of foreign correspondents into the Palestinian side of the strip, has also been denying Israeli reporters direct access to the front and instead making officers available periodically for interviews.